Stephens, a guest of the Office of Global Initiatives and it’s executive director, Rick Hutto, came to celebrate the first cohort of high school dual enrollment students in the State of Georgia to earn academic college credit while studying abroad through a technical or community college. As Stephens addressed the students, he shared his experience and role within the Irish government, providing insight as to the culture, political landscape, and some historical similarities between the United States and Ireland. The group of 38 headed abroad this summer are comprised of students, instructors, and chaperones from the College’s 11-county service area. The group will be on-hand Thursday to meet Stephens and learn about the country where they will spend ten days this summer immersed in vast cultural history, participating in guided tours through museums and castles, all while earning college credit. The first-of-its-kind program is scheduled to continue into the summer of 2020. 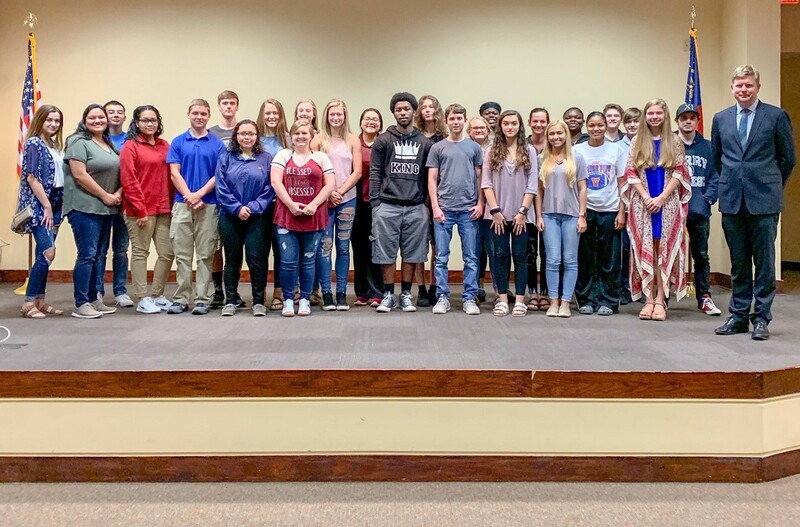 Photo: CGTC Dual Enrollment students headed to Ireland this summer gather with, the Consul General of Ireland for the southeastern United States, Hon. Shane Stephens, (far right) upon his visit to the Warner Robins campus. This entry was posted in 2019 and tagged dual enrollment, Global Initiatives, high school, Ireland, Rick Hutto, social, study abroad, travel. Bookmark the permalink.